Home / Home Improvement / How to Remain Safe While Using a Wood Router? How to Remain Safe While Using a Wood Router? A serious woodworker will always prefer to have a woodworking router in his workshop. If this versatile tool is used in proper and safe manner then you can create different things using it. On the other hand, if you do not take safety measures then there can be serious accidents that may cause danger to its users. Therefore, to prevent any such mishaps you must follow various safety norms and take your time to know about them. 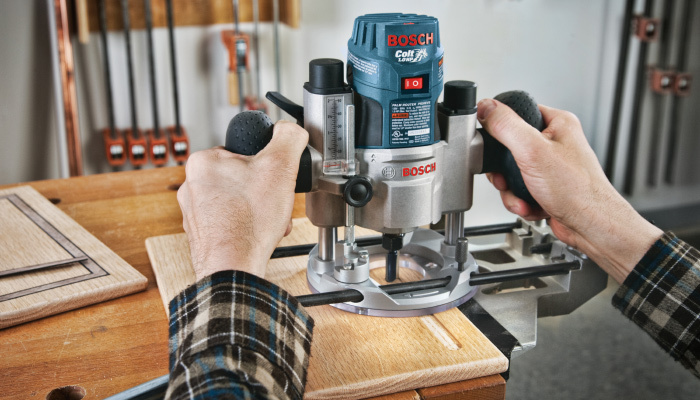 In this small write up, we shall discuss few safety tips that you need to follow while handling your woodworking routers. Following are few safety tips that you must be aware of while handling your woodworking routers so that you can keep the person handling this router safe. It is important that while the wood router is running you or the person who is working with the tool must keep himself safely. Keep your fingers away from the bit area so that there is no way it gets hurt while the tool is spinning. You must route your work piece by using the push block so that your hand remains away from the bit of the router. Use of push stick or push block is very much necessary particularly when you are handling narrow or any small piece of wood. In order to increase the safety, you can fit any guard by using transparent Perspex sheet so that the working area will remain covered and at the same time you can see the progress of work as well. You can also use any feather board so that it is possible to keep the work piece properly pressed against the fence that will keep your fingers remain safe. Usually while the wood router is in operation, it generates very loud noise that can affect your hearing. Therefore, it is essential that you must use some protection for your ears. Also, you must use any respiratory protection when the power tool is in operation. Use safety goggles while working with wood router because while operating it chips can jump out of the tool and can hit the eye. In addition to that if your wood router is hand held type then it is important that your work piece must be securely held by using a vice or clamp the router table or bench whatever may be the case. You can also use any friction mat so that it will prevent your work piece to shift from its place when the wood router is running. You can also learn more about many other safety tips by reading the review on the internet. Maintain the router properly. In case of any damage or any problem is noticed, it must be immediately sorted out.